Ecstasy and LSD should be downgraded from Class A to Class B, a government adviser on drugs law has proposed. Professor David Nutt, who chairs a committee of a drugs advisory council, said grouping the drugs with others in Class A, like heroin, was an "anomaly". But he said barbiturates could be "worth moving up to Class A". Currently, possession of a Class A drug carries a maximum jail sentence of seven years, compared with five years for a Class B drug. The penalties rise to a maximum of a life sentence for supplying a Class A drug, and 14 years for Class B. Professor Nutt's comments came after the Commons' all-party Science and Technology Committee asked which drugs were wrongly classified. "I think 4MTA, LSD and ecstasy probably shouldn't be Class A," he said. 4MTA, or methylthioamphetamine, is a derivative of ecstasy, but is not as widely used. Professor Sir Michael Rawlins, chairman of the Advisory Council on the Misuse of Drugs (ACMD), confirmed that a review of ecstasy's legal ranking was under way. The review would examine whether more could be done to reduce the harm caused by the drug, which is taken by an estimated 500,000 people a week. Drugs minister Vernon Coaker said he would examine any recommendation put forward by the ACMD, but said that did not mean action would definitely be taken to reclassify the drugs. "If the ACMD look at a drug and come to us with a recommendation of course we will look at it," he said. "Whether we then act on it will be a matter of political judgment." 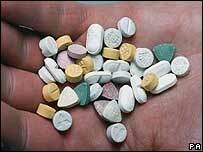 In 2002, a recommendation by members of the Commons' Home Affairs Select Committee to downgrade ecstasy to Class B was dismissed by the then Home Secretary David Blunkett. Last month Home Secretary John Reid said he would not revise the drugs classification system, despite claims it inadequately reflected the real harm of drugs, and excluded legal substances such as alcohol and tobacco.